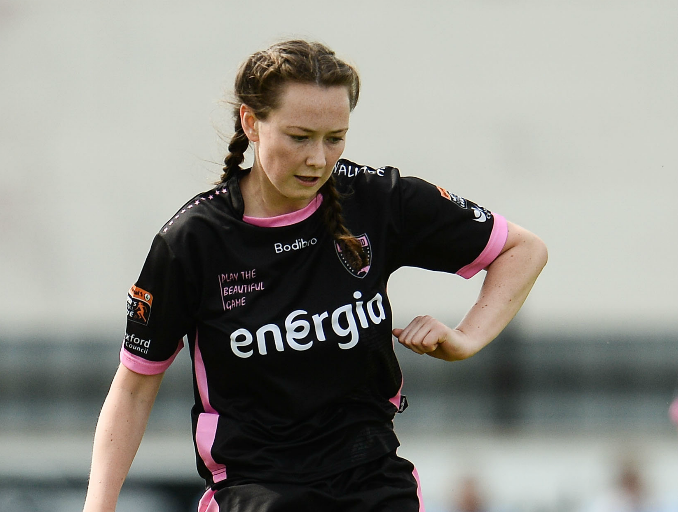 With two Women’s National League medals and Champions League adventures in Poland already propping up her resume, Aoibhín Webb is enjoying a promising spell at the pinnacle of women’s football in Ireland. A student of Irish and geography in St. Patrick’s, the Carlow native balances her WNL duties with college and the DCU women’s soccer side, but this summer she embarked on a landmark trip, joining seven other students of the college at the World University Games in Taiwan. But despinte having hosted the best European football has to offer at Ferrycarrig Park, Webb sees the Taipei trip as her greatest adventure to date. “Poland was absolutely brilliant”, recalls Webb. “But in Taiwan, to get to wear the Ireland jersey was unbelievable, and there was such a good atmosphere, it was brilliant. “It was the best three weeks ever, you’re just in a bubble, in a world of your own and you never want to go home. “It was unreal, the best experience of my life by far. “We had one day off, in three weeks just the one day off. “It was after the first two games, we had a day off and we went to Taipei 101, then we went to Elephant Mountain and got to watch the sunset up there, but it was some trek, our one day off and we walked up a mountain”, said Webb. The striker got her first taste of the green jersey at the games, as senior women’s national team coach Colin Bell led a strong Irish selection over to the festival. A great result in an opening day 0-0 draw against group favourites Mexico had the girls buzzing, but the Canada defeat after just one day’s recovery saw slim hopes of qualifying for the quarter finals resting on a result against the host nation, Chinese Taipei. “There was an unreal buzz at that game”, she adds. “It was packed, and like they were the friendliest people in the world, even if we went on an attack there’d be like “ooh ahh. “After the game, we drew and it went to extra time and we beat them on penalties, but the other result didn’t go our way so we didn’t make it”, said the footballer. Webb is now back in DCU and looking forward tio the challenge with the girls this year after promotion by the flip of a coin last year, with tough games against rivals UCD, NUI Maynooth, and IT Blanchardstown awaiting.